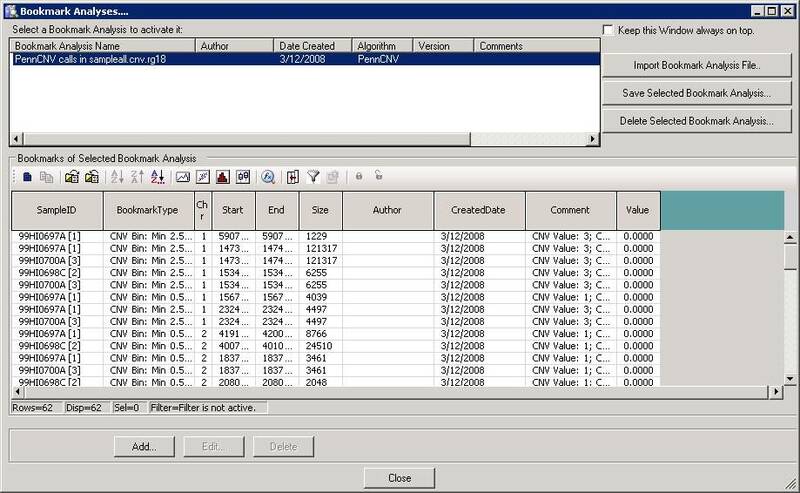 This section gives some illustrative examples on how to manually examine the CNV calls in Genome Browser as well as in BeadStudio. In many cases, by looking at the actual signal intensity values in BeadStudio, we can gain a higher confidence in CNV calls, or immediately recognize false positive calls. Similarly, by putting the CNV calls into Genome Browser, we can compare the calls with previously reported calls in the genome, or we can see whether the call coincide with a segmental duplication region, and we can examine the surrounding genes or other functional genomic elements. It if often helpful to visually examine CNV calls to judge whether they are reliable or not. 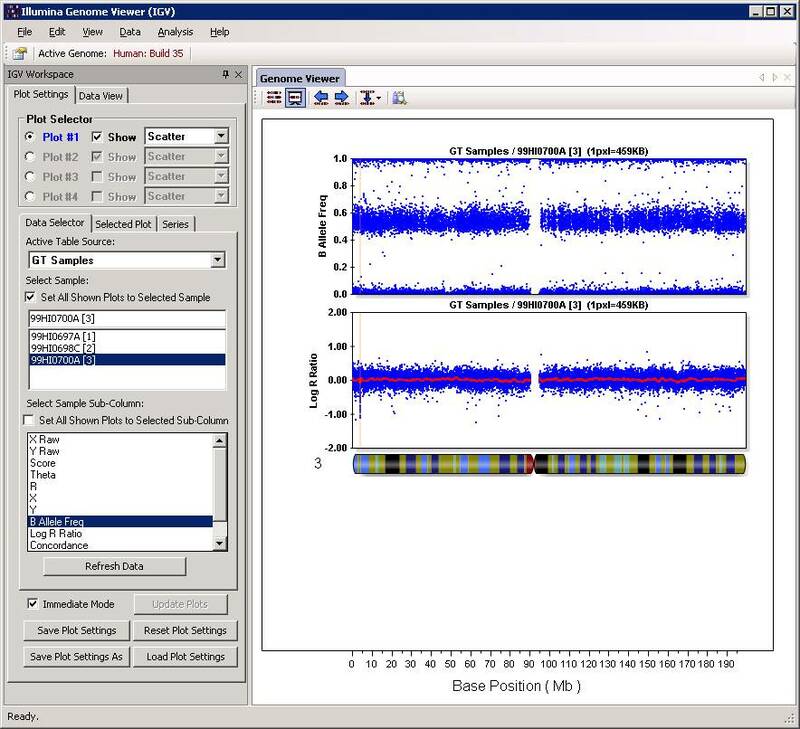 Doing so manually in the Illumina BeadStudio software or the Affymetrix genotyping console takes too much time and effort. Therefore, the visualize_cnv.pl program provides a convenient way to generate image files for CNV calls automatically. The example below illustrate how this can be achieved. Note that this procedure should usually work in default Linux installations, and may not work in Mac or Windows. For Mac, make sure that the R language and the ghostscript is installed (type "gs" to check about it). The ghostscript can be downloaded from http://pages.cs.wisc.edu/~ghost/. This command basically check the ex1.rawcnv file for all CNV calls made on the signal file (offspring.txt), and then plot the signal intensity (LRR/BAF) for these CNV calls. The plotting function requires R to work, so make sure that your system has R installed. The output file names are shown above. One CN=0 example example is given below. We can see that the LRR drop to very low levels, yet BAF randomly distribute between 0 and 1. By default, the CNV region, as well as the left side and right side region with identical sizes, are shown in the figure, with the CNV marked by two gray vertical lines. Another CN=1 example is shown below. The LRR drop to around -0.6 region, yet the BAF cluster around either 0 or 1, but not near 0.5. It is a de novo CNV, which can be furhter validated by the de novo validation procedure. The visualize_cnv.pl plotting function is quite rudimentary. If you want really fancy output, you can edit the source code (search to the R code section) to modify the subroutine that generates R code. The program generates JPG output files. If you want to have PDF output so that the figures can be inserted into vector-based graphs for publication purposes, you can get an updated version from the download page. In addition, the updated version can use "Mb" rather than "bp" as the data labels in X-axis. The program visualize_cnv.pl can help convert the PennCNV output to BED format (for visualization in UCSC Genome Browser), to XML format (for visualization in Illumina BeadStudio Genome Viewer), to HTML format (beta-testing feature: for visualization in Internet web browser for family-based CNV calls). The above command converts the CNV calls to BED format, with the track name as “CNV in a family”. The output is written to the sampleall.bed file. Now click “go to genome browser”. In the “position/search” box, type a gene of interest, or a genomic region of interest (for example, try typing LRRN1), then use “zoom in” and “zoom out” to examine the genomic regions for CNVs. The offspring (sample3.txt) has a deletion CNV (marked as red box in the custom track) downstream of LRRN1. (However, UCSC known gene prediction shows that this deletion is within the UNQ3037 gene; in general, UCSC known gene annotation has more genes than RefSeq Gene annotations). The track will be only visible to yourself in your web browser for a limited period of time: other people will be able to see it, so do not be afraid of uploading your data to UCSC Genome Browser. 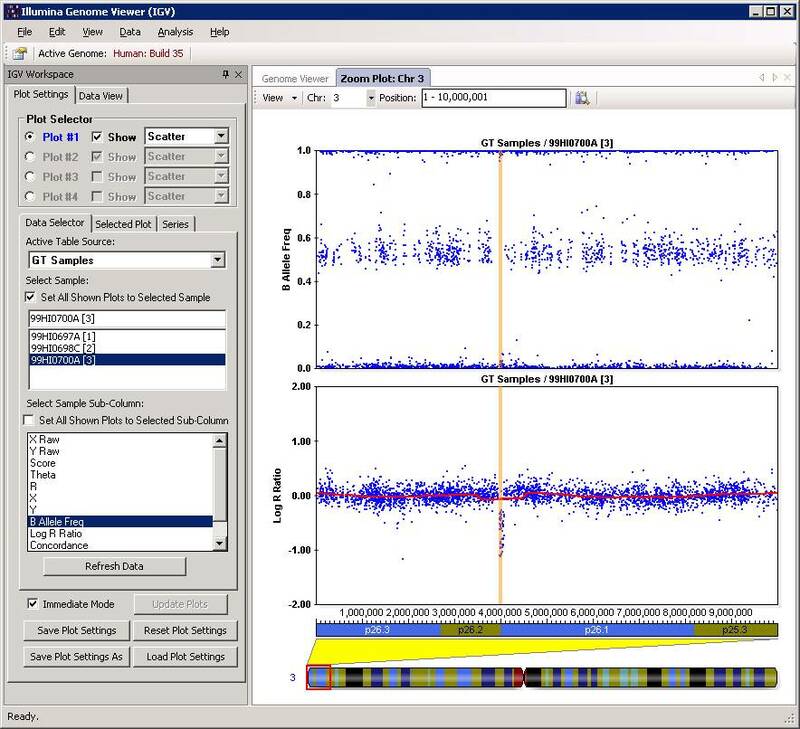 Some times, it may be convenient to visualize the CNV calls in BeadStudio software, so that one can manually examine the calls with respect to the Log R Ratio and B Allele Frequency values and judge whether the calls make sense or not. This idea was originally brought up and implemented by Dr. Bryan Traynor, so I adopted this approach for BeadStudio users.